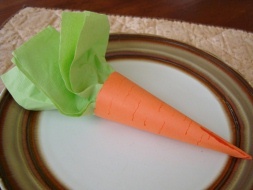 These Carrot Napkin Holders are the perfect addition to your Easter table, not to mention that they are an easy and fun kids craft! 1. Cut your construction paper into a cone or "carrot" shape. 2. Roll up your paper to look like a carrot. Glue or tape to secure it. 3. If the end of your carrot is a little uneven you can trim it with some scissors. 4. If you wish, use an orange marker to make "carrot" lines on your paper. Then, Unfold your napkin once, so that it makes a long rectangle. Gather it in the middle, and insert it into your paper carrot.